A tasting event at Vine & Table, Carmel, was a near sell-out event! CARMEL, IN. – Anyone serious about wine has probably learned the size of the glass can have an impact on the taste of the wine. You’ve probably seen all those different size and shaped Riedel crystal wine glasses in shops or advertisements and thought it was all silly. It’s pretty easy to be skeptical when checking the prices on Riedel crystal. Still, there really isn’t anyone in the world doing what they do. Riedel has been creating grape varietal specific glasses for nearly 50 years. Members of the Austrian Riedel family, and their sales staff, travel the country constantly putting on tasting seminars to sell their product. A recent event at Indianapolis’ Vine and Table Market provided convincing evidence the glass makes a bigger difference than most novice wine drinkers might think. The seminar included three glasses made specifically for Oregon Pinot Noir, Syrah, and California Cabernet. 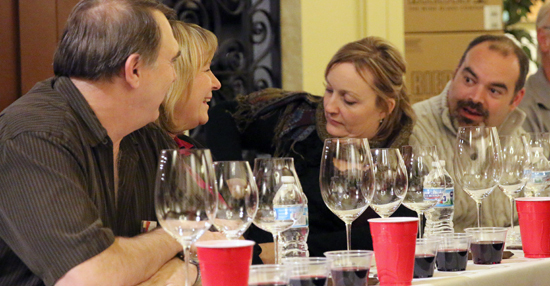 The more than 40 participants poured each varietal into all three glasses then were led through a tasting. The difference on the nose and palate was striking. “No one else out there does what we do which is create a glass specifically for a grape,” said Julio Ruiz, a Regional Sales Manager for Riedel. “Through workshops, more or less like the consumer experience of a tasting like this one tonight, we create a new glass. That example was timely because one of Riedel’s latest creations is a Malbec glass created in a partnership with the Argentinian label Graffina. Riedel is not the only company in the world making different sized glasses, by any means. But they take it to levels far beyond anyone else in the business. The company history is fascinating with the birth of Johann Christoph Riedel in 1678 and the family’s start with luxury glass goods. Maximilian Riedel is the 11th generation to head the company business in Kufstein, Austria. An Oregon Pinot, Syrah, and Cabernet glass. Riedel crystal makes an outstanding wedding gift, holiday gift, or a special treat for your wine cabinet. Let’s be honest here – it’s not cheap. Most Riedel glasses start with the factory made crystal from Germany which runs in the $20-$30 a glass range. The hand-blown wine glasses from the historic Austrian plant produces stunning stemware that costs up to $159 a glass. No one is going to rush out and purchases pairs of the 30-40 different wine glasses. Ruiz offered some advice for getting started. Howard’s Pick: I’ve never recommended anyone go buy Riedel crystal and that’s not the point of this column. I think a nice smaller glass for whites and big-bowled glass for reds is a good place to start for most wine drinkers. For those more serious about their wine, the crystal wine glasses are worth the investment.